“When I get closer I see he’s as small as me, thin as a whippet. Rangy. Hair long and ropey right down his back and falling across his face. He’s wearing an old pair of shorts and a way too big jumper. Then he starts talking and it hits me. It’s a girl. Voice real high and panicky. Finn has lived on his own amongst the meleleucas on the rugged Victorian coast since he was just fourteen years old. His best guess is that he’s survived for two years since a deadly virus (and the violence that followed) killed his parents and most of his small community. Finn and his dog Rowdy have settled into a neat routine in their isolation, surviving on trapped rabbits, abalone and veggies traded with old Ray, the only other survivor in the region. Finn and Rowdy make a great team, always finding time for a surf and (so far) staying out of sight of the Wilders, an armed and dangerous gang that controls the north, led by a ruthless man named Ramage. Enter Rose, an Afghan asylum seeker who has escaped from the enslavement of Ramage. She is desperate, sick, and needs Finn’s help to finder her sister, Kas. 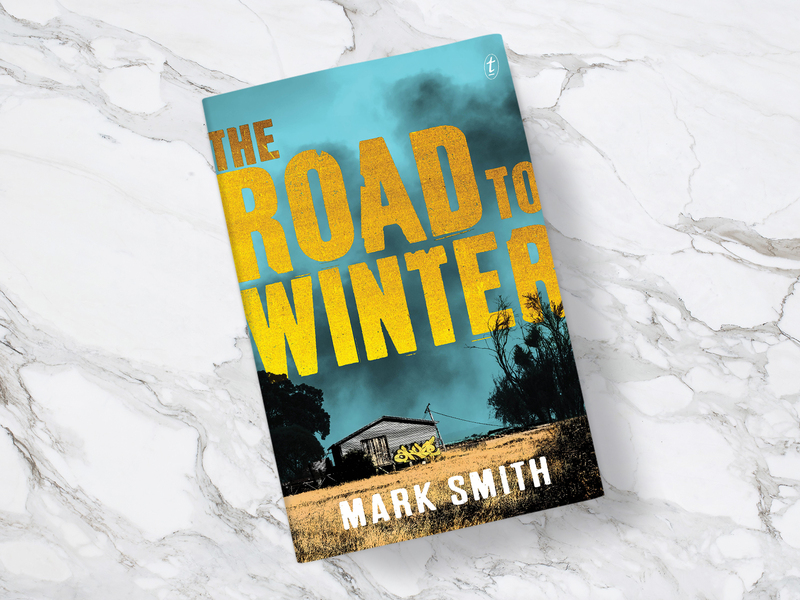 The Road to Winter is a strong debut for Mark Smith, who has started his Winter dystopian series for young adults with a captivating examination of humanity. Single-sitting reads can quickly be forgotten, but the rapid narrative pace of this novel is paired with a visceral atmosphere and enough subtle hints of a dystopia frighteningly easy to imagine to keep The Road to Winter (and the smell of tea trees and wet sand) in mind for long after the final page. Smith’s imagining of an Australia that has ‘progressed’ from offshore-‘processing’ of asylum seekers to a modern take on slavery is sadly not unimaginable, setting up a series of power dynamics and perspectives on human cruelty that strike a chord in a contemporary Australian reading. Seeing these play out through the eyes of Finn - a boy becoming a young man in the absence of the social structures that shape the adults we become - adds a dimension to the post-apocalyptic narrative that more than once had me reflecting on Cormac McCarthy’s The Road. Like The Road, The Road to Winter is a story of survival, vulnerability, masculinity and family. Likewise is it bleak and, at times, gruesome (not McCarthy-bleak or -gruesome, but still bleak and gruesome nonetheless). But Smith also brings a warmth and hope to his imagining of survival. Indeed isolation is not just a cruel fact of post-apocalyptic life for Finn; it also offers solace. Finn’s meditative surfing habit provides a freedom and distance from the monotony of survival. Smith clearly has a keen understanding of the development of masculinity and manhood in the critical mid-teen years, and it shows in his creation of Finn. It would be easy to create a boy-scout/Bear Grylls hero, but Finn is a vulnerable, emotionally intelligent and compassionate young man. Likewise are the supporting cast carefully crafted characters with depth, although I must admit I was taken aback by the rapid development of Finn’s relationship with Kas (particularly from Kas’ perspective). I was also a little thrown by the addition of Willow to Finn’s motley crew, but presume she will have a significant role to play in the forthcoming sequel. The Road to Winter is a compelling and intelligent story of survival in a bleak but beautiful Australian coastal setting. Smith’s straightforward writing style (at times reminiscent of stablemate Jock Serong - perhaps there’s something in that salty coastal air?!) is easy to read and should be appealing to the wide readership this book deserves. A great read - looking forward to the follow-up in May 2017. This book is a great read for anyone, but would be a terrific gift for a contemporary of Finn’s. Don’t be afraid to buy this for a young adult that ‘doesn’t read’ unless they’re required to by their school curriculum - it is a page-turner and written from the perspective of a relatable young man. The Road to Winter is the perfect opportunity to get someone into reading.